The average newly built home in America today offers more than 2,600 square feet, and the shrinking nuclear family means that works out to about 1,000 square feet per person. As of 2012, four in 10 homes were built with at least four bedrooms, and more than nine in 10 had at least two bathrooms. It wasn't always this way. Americans haven't always preferred to build mini-mansions, expected that every child have her own room, or paused, aghast, at the thought of getting along with a single bathroom for a family of four. American homes used to be much smaller. I live in one of them. My husband and I bought our first home in Minnesota's Twin Cities three years ago, a purchase we made despite my rampant consumption of avocado toast. Our house is small, but it isn't a tiny home or a cottage. In fact, when it was built, it was exactly average. Built in 1915 in a neighborhood then designated for "Workingmen's Homes," it measures around 1,000 square feet. There is only one bathroom and no good place to add another. The kitchen boasts a mere 16 square feet of counter space and no room for any eat-in situation. The bedroom closets are mercifully deep for the age of the home, but let me emphasize the impact of that qualifier. Our lot, standard for the area, is 30x100 feet. On one side, our house sits two feet from the property line, and our neighbor's house about five feet beyond it. We could speak to each other from our living rooms, if we wanted. I'd be lying if I said I never browse the sprawling Victorian masterpieces in our local real estate listings with a lustful eye, but in my more sensible moments, I can tell you without a single doubt, we have all the space we need, and that having more space would lower my quality of life for all sorts of reason. Just like it may be lowering yours. The most obvious cost of living large is the literal cost. Adjusted for inflation, new homes have cost about $110 per square foot since 1973. That means, in real dollars, the average new home today costs more than twice what the average new home cost half a century ago. (Energy bills are higher, too, as efficiency gains brought by modern building technology are lost in larger homes.) More than doubling your housing bill will take an enormous toll on every other part of your financial life. And remember, you'll be paying all the time for a lot of space you only use some of the time. Does your home have a formal dining room and an eat-in kitchen and a breakfast bar or nook? How often do you use all those spaces? (Let's be real: How often do you ignore all of them and eat on the couch instead?) Yes, it's nice to have these extra rooms for special occasions, for all the entertaining we're so sure we're going to do. But it's not realistic, and it's certainly not financially sound. A study by the Center on Everyday Lives of Families at the University of California found that having spare rooms almost always means having empty rooms, which don't come free. What these spaces aren't empty of is stuff. Just as work expands to fill the time allotted, our useless crap expands to fill the space we give it. Our houses are bigger because we need more space to store our junk, and our junk pile grows because, hey, there's room for it in the garage. You don't have to go full KonMari to recognize that this isn't healthy, and it certainly doesn't make life better or wallets fuller. More space and more stuff also means more cleaning, repairs, and a heavier mental load of household chores. This is especially true for women, who continue to do more housework than men, even when they work outside the home or — appallingly — when sharing a home with an unemployed man. A bigger house means more to mow, more to vacuum, more to clean, ad naseum. While working women in particular do not benefit from excess square footage, I'd argue all demographics suffer a loss in quality of life when their house is too big. That's because big homes isolate us. They separate us from each other within the house, and they encourage us to treat our home as our personal fortress, our bulwark against the broader community. One thing I've noticed about living in a neighborhood of mostly smaller homes is that it forces people outside. You know all that stuff you've read about how kids don't play unsupervised anymore? Yeah, helicopter parenting doesn't work so well if you don't have the indoor space to be cooped up with a 7-year-old all day. Kids are out playing in my neighborhood all the time. People sit on porches. 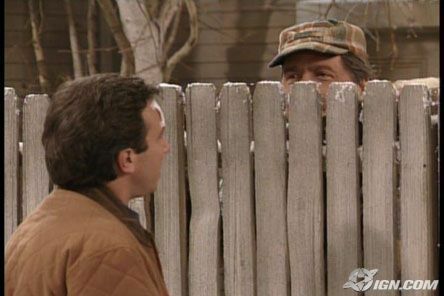 I talk to my neighbors, Home Improvement-style, over the backyard fence. We go outside more often because we only have so much space inside, and that's a good thing. "I always wanted a house big enough that my kids could be in their room screaming, and my wife could be in a room screaming, and I could be somewhere else and not hear any of them," Michael Frisby, a former Wall Street Journal correspondent and owner of an 11,000-square-foot home, told NPR in a piece on booming home sizes. What Frisby wanted is what I never want. Don't get me wrong: I'm an introvert's introvert. I love being alone in my house. But at a certain point — which I would suggest is somewhere well below 1,000 square feet per person — extra space becomes dysfunctional. "I worry about the future of a culture and a society that has this extent of excess in it," says John Halsey, president of Peconic Land Trust. "I think there is a disconnect, and we are in a bubble. Somehow, we are just not experiencing the realities that the rest of the world is." If you own an American home built in the last three decades, your house is probably too big for your life, sucking away your money, energy, time, and relationships, and adding only to your accumulation of stuff. It won't be an easy problem to fix, for you or for the American real estate market more broadly. But as a happy owner of a small home, I can assure you it's a problem worth fixing. Next time you buy a house, consider shopping small.